Learn how to dress up as Dennis the Menace! World Book Day is back on 5th March and this year it’s getting a special menacing makeover! 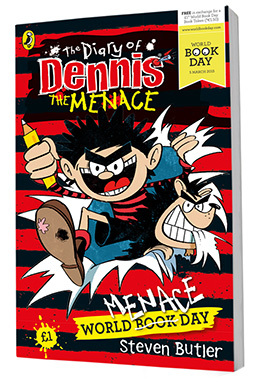 The Diary of Dennis the Menace: World Menace Day is the special new book for World Book Day by Steven Butler, author of the Diary of Dennis the Menace series. Written just for World Book Day, you can get the book for just £1 or free with your school tokens! And to get you ready, Puffin’s team of menaces have created this great video showing you how to give yourself your very own menacing makeover. So if you’ve ever wanted to dress up like Dennis, see how to do just that with this video. Enjoy! World Book Day provides an opportunity for children and schools to fundraise for Book Aid International, who provide books for children in Africa who may have never owned a book of their own. Click here to download the Dennis the Menace dress up sheet!